Because I happen to be there and have the time, I walk for miles across the city, getting to know it step by step. 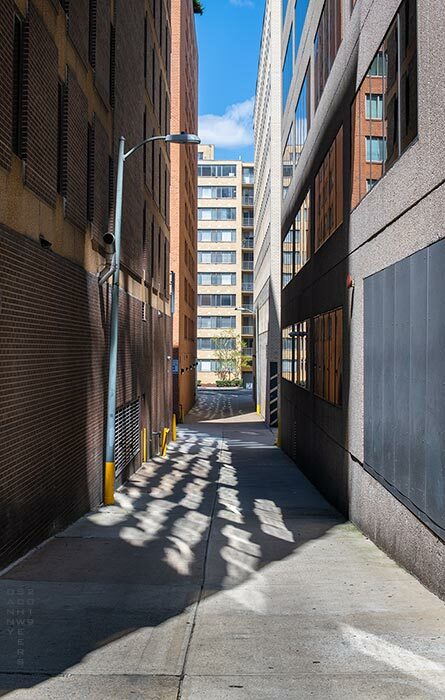 So when I pass an empty alley, it seems random that I should be there at that time and place, an accident, a fluke or a blessing that I should be there at the right time to witness the sun at just the right altitude and azimuth to perfectly cast shadows and reflections in mathematically-satisfying patterns. No one else stops in admiration. No one else bothers to look. They are too busy going places to glance at this place which is, after all, just a humble alley, even if it is transfigured by the light. I look. I see. I wonder. In the right light, might we too be transfigured? Photo of an alley at 2141 K. Street, N.W. in Washington, D.C. at 12:52 p.m. on Sunday, March 31, 2019. Wow and what a perfect Easter week posting. Danny, have a blessed Holy Week and a joyous Easter -- the Light that transfigures us all! And with God's light, is our humility made divine? You got a great image out of the DC landscape! That is quite a feat.